We’re sitting down today with Lt. Gino Tenpenny, the hero of “Devil’s Hollow,” a detective mystery on sale at Amazon.com. Hopefully this will be the first of several short interviews with the veteran lawman. Author: Lieutenant, I understand that you’re usually the one asking the questions, but you don’t mind answering a few questions for our readers, do you? GT: But before we get started, let me clear up something. GT: In your introduction, you called me a hero. I’m just a working man. Hero is a word that gets tossed around much too often these days. A: Now, getting to our story. You gave a certain magician a hard time in Devil’s Hollow. Tell us, how do you really feel about magicians? GT: (Scoffs) I put them right at the top of a list that includes evil clowns and ventriloquist’s dummies. GT: It’s not intended to be. A: Okay. There’s a tweet making the rounds about you giving The Most Interesting Man In The World a wedgie when you were kids. True? GT: (Squirms in seat) Not true. It wasn’t a wedgie. It was a noogie. Don’t read anything into it; we were just fooling around. We’ve always been the best of friends. A: I understand that you’re a religious man. GT: I attend Mass every day. A: The Latin Mass, I understand. GT: That’s right. I’ve got a strong belief in tradition. A: Yet you once knocked out a priest with one punch while you were in high school. GT: That’s not much to brag about. He had a glass jaw. A: What caused you to strike a man of the cloth? GT: He made a remark about my father’s heritage. I took exception to it. GT: There are no free passes when you’re insulting someone’s family. A: Yet that wasn’t the first time you resorted to physical violence, was it? A: I think you were 13 at the time. Author’s Note: Except for the ending, I thought this first interview with Gino Tenpenny went as well as could be expected. The lieutenant may disagree, but we’ll try again at a future date. 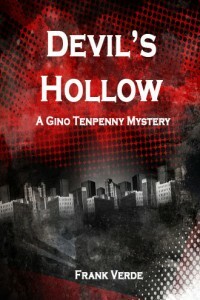 Please stay tuned to this blog for the latest on Devil’s Hollow, A Gino Tenpenny Mystery. E-books can be downloaded to your computer, either PC or MAC, or can be read on Kindle devices and applications for the iPad, iPhone, Blackberry, Droid and Window 7 phones.